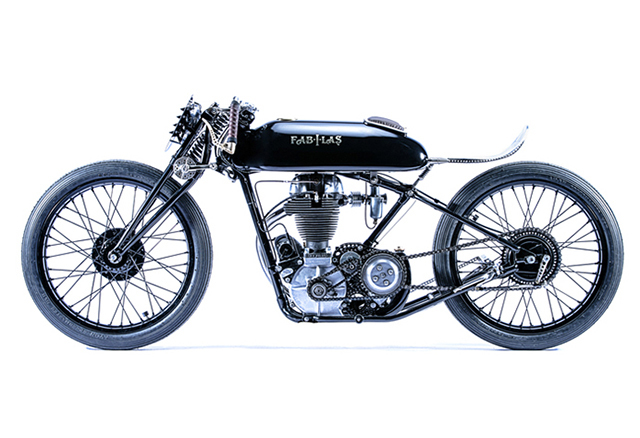 The frame and engine utilised in the build had been a part of the furniture at the Young Guns workshop, with the majority of their time being spent on other people’s bikes and higher education. 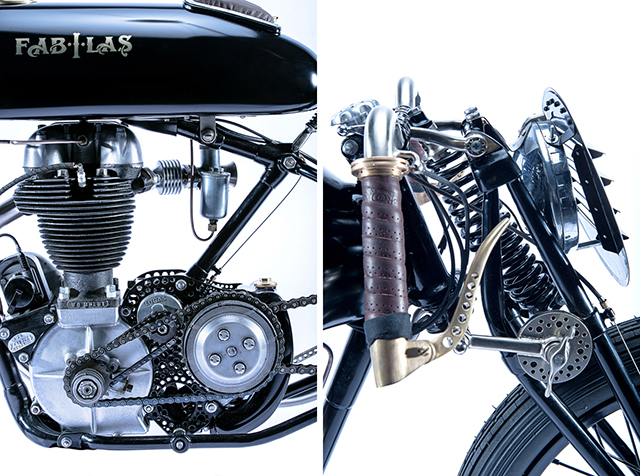 Inspired by British pre war racers such as Roaring Anna and Violent Violetta, it was decided the AJS would be given a freshen up and built in the period specific style. To give the bike a sleeker look, the frame was stretched 12cm, and lowered 8cm. It may not seem like much, but it gives the mid sized machine a much better stance than it left the factory with. The front end alone is a work of art. 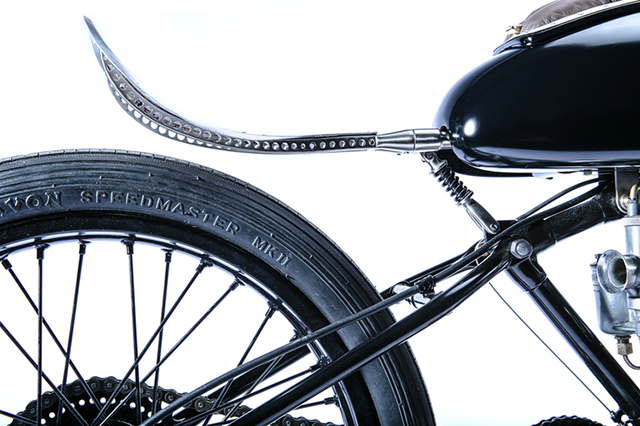 Mounted on the 1936 Webb girder forks are the handlebars created especially for this build, with 26 separate parts making up the board track style controls. Grip mounted levers allow for adjustment of timing and carbs without having to let go of the controls, the grips wrapped in leather tape sourced from Brooks. 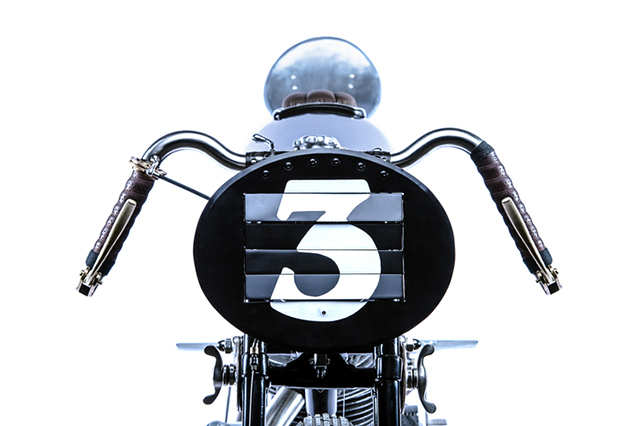 With an aim for function, as well as form, a Smith headlight was mounted up on the front forks, perched behind a louvred racing plate. Manufactured from 0.5mm alloy, you can leave the racing number showing in the day, then flip the handle and have light at night. 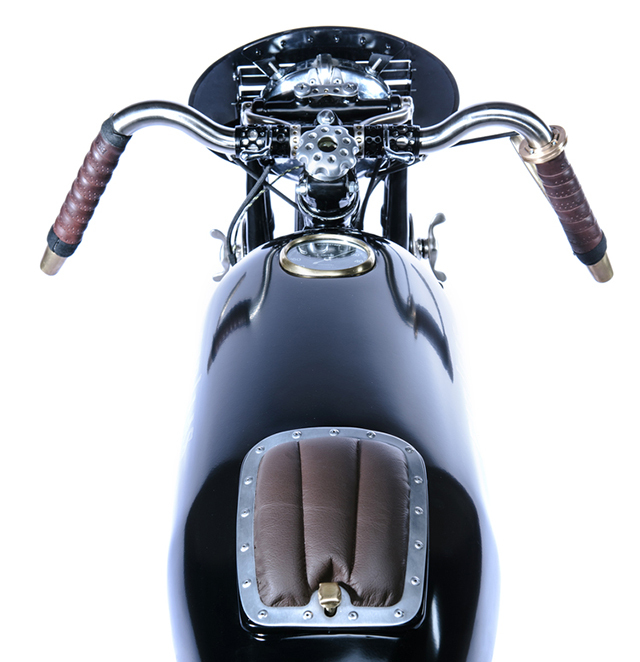 To keep the centre of gravity low, an oil tank was manufactured in house, sitting low behind the transmission. While the Young Gun crew were at it, they produced the fuel tank to keep with the aesthetique of the build. Sitting proud on top of the tank is a 1950s Smith speedo sender, while at the back end of the tank, enclosed under a pillow is the spare spark plug and filler cap for the tank. 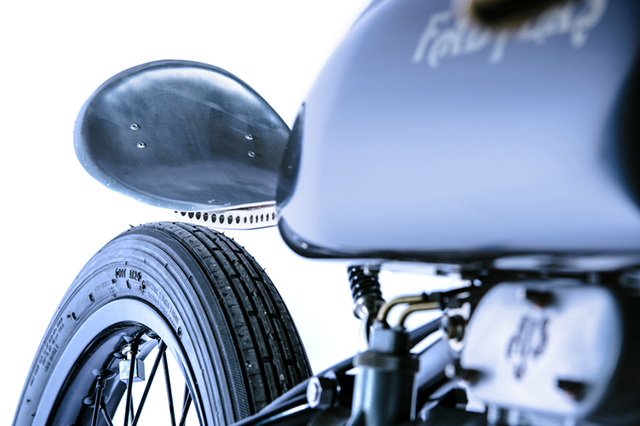 To ensure the bike kept with that old school racer look, the factory front hub was narrowed by 3cm, and the skinny as twenty inch rims roll on 3 inch Avon Speedmasters. 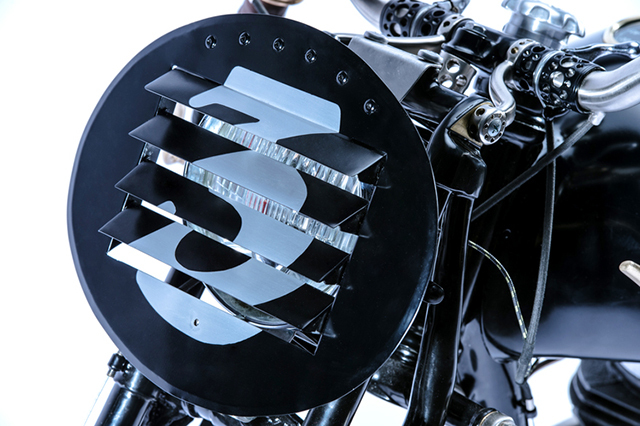 Performance mods have been kept simple, with both the engine and transmission being given a freshen up, the exhaust hugging the frame, and a special carb manifold being welded, drilled and milled to add to the look. 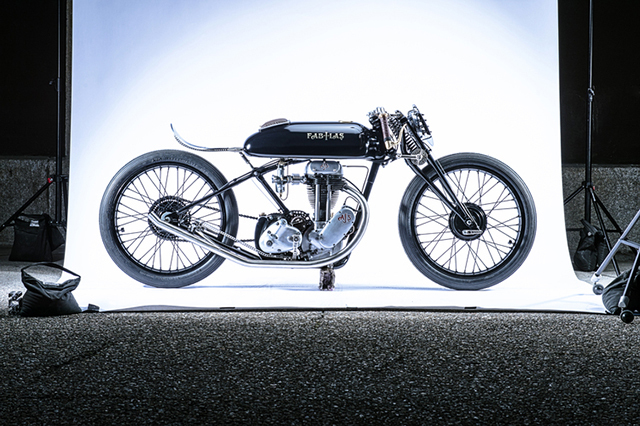 From dust collecting relic to a sporting homage, this AJS now resides in Dubai after being purchased by one lucky gent with deep pockets. The guys from Young Guns were reluctant to see Fabilas go but really needed the money for future projects – and from the look of this one we can’t wait to see more.